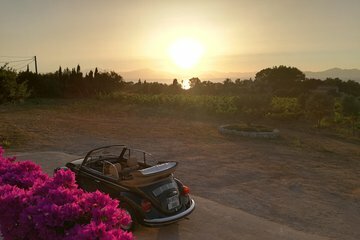 Enjoy two of Majorca's best features—ocean views and wine—on a private tour by open-air Volkswagen Beetle. This evening excursion takes you to a small wine cellar in Colonia de Sant Pere, where you can look out at the waters of Badia d'Alcudia and watch the sun set behind the mountains of the Serra de Tramuntana. All fees are included in final price. Recommended to wear comfotable shoes and sunscreen.